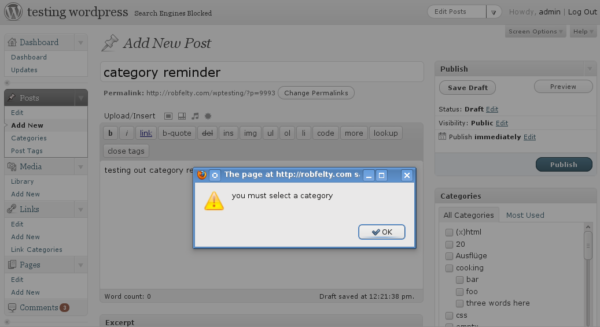 I recently released my sixth wordpress plugin – category reminder. I have seen several requests around for a plugin which forces users to select a category for each post they publish, so that the posts don’t just end up as uncategorized. Bloggers with multiple authors seem especially interested in this. I have wanted this requirement for myself as well, since I sometimes forget to categorize a post before publishing it. Now users can easily add this functionality via this plugin.